The black-tailed godwit (Limosa limosa) is a large, long-legged, long-billed shorebird first described by Carl Linnaeus in 1758. 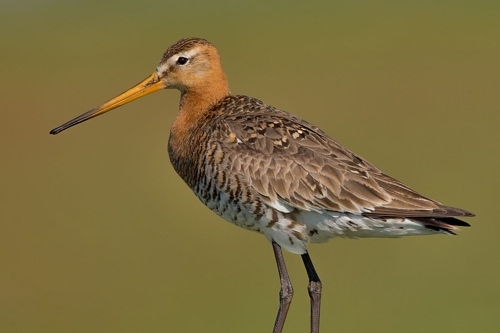 It is a member of the godwit genus, Limosa. There are three subspecies, all with orange head, neck and chest in breeding plumage and dull grey-brown winter coloration, and distinctive black and white wingbar at all times. Its breeding range stretches from Iceland through Europe and areas of central Asia. Black-tailed godwits spend (the northern hemisphere) winter in areas as diverse as the Indian Subcontinent, Australia,New Zealand, western Europe and west Africa.